Bickle's journey to professional stardom began with Cornish side St Austell, together with midweek games for Co-op Welfare of the Devon Wednesday League, and his prolific scoring record attracted the attention of Argyle manager Derek Ufton. He soon started scoring for Argyle reserves, and, after leaving his job as a milkman with the Co-operative Society, was handed his debut against Southampton in December 1965. Naturally Bickle scored, and he kept on scoring for the next six years. As a local boy, Bickle was the darling of the Home Park terraces, and his courage in the penalty box endeared him to the supporters even more. He finished top goalscorer in his first four seasons with Argyle, and seemed destined for a long and successful career in the game. The Pilgrims accepted an offer from Gillingham for his services in 1971, but he struggled to settle in Kent and then disaster struck. A collision with a team-mate during a game at Stockport left Bickle temporarily paralysed, and, after an aborted comeback, a broken bone in his neck forced him into early retirement. My first ever game at Home Park that my dad, who was a lifetime fan, took me to was an FA Cup 3rd Round tie against Corby Town. Argyle ran out 6-0 winners with Mike Bickle getting a hatrick against them. After that I was hooked even though we lived in Newquay, and Mike Bickle was my first Argyle hero. There have been many more since in the last 47 years. As a milkman with the Co-operative Society, Mike Bickle built up a scoring reputation at two levels — on Wednesday afternoons with Co-op Welfare in the Devon Wednesday League and on Saturdays with St Austell in the South-Western League. Eight goals in six games for Argyle Reserves at the end of 1965 were enough to convince manager Derek Ufton that the centre-forward had something to offer the club. 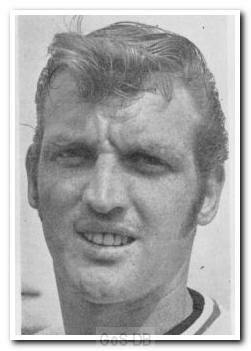 Bickle signed professional terms in December 1965, was given a first-team chance and ended the season with nine League goals in 17 games, a record on which he could well have improved had injury not prevented his appearance for a few games. The initial promise was to be confirmed and he went on to become the club's leading scorer for the next four seasons. He was not tall but was strongly built and able to withstand the heavier challenges of defenders. Twice he scored four goals in a match for Argyle, against Cardiff in October 1966 and against Torquay on Boxing Day 1969. His period with the club was not one of the most successful in Argyle's history; one can only surmise that, as part of a more successful team, his record would have been even better. He had just over a season with Gillingham after leaving Home Park before an injury forced his retirement from the game. My first game at Home Park was in September 1964 when Argyle beat Newcastle 2-1. I was hooked for ever and became a HP regular from that day on. My only regret was that I would see less of my home town club St. Austell and in particular my hero Mike Bickle. My long standing memory of Mike playing for St. Austell is when he scored all 9 in a 9-2 away victory at Nanpean Rovers. You can imagine my joy when Bickle "followed" me to Home Park in 1965. He embraced the rise from South Western League to Division 2 with little difficulty. He was a natural goal scorer at any level. I believe Mike scored in each of his first four Argyle games, this amounting to 7 goals in total. Having now completed 50 years as a HP regular, I can still say Bickle would be in my top 5 Argyle players of this period. Looking through a box of programmes at a collectors fair I came across Gillingham v. Argyle in the FA Cup Round 1 on 20 November 1971. It didn't sink in straightaway but this was Mike Bickle's home debut for the Kent club having signed earlier in the month and provided the two assists that enabled Gillingham to beat Reading 2-1 away the week before the cup tie. The programme makes a real fuss of the qualities that Mike Bickle will bring to the team, managed at the time by Andy Nelson who had played with Mike for Argyle of course. Sadly for Mike, through injury he did not have the opportunity to provide Gillingham with the service he provided Argyle. Mike was a real goal scoring legend - one of our crowd of regulars reckoned he could have played for England! Perhaps not but he maintained an impressive record over several seasons and combined a Micky Evans wholeheartedness with some of Wilf Carter's nose for a potential goal-scoring opportunity. He never let Argyle down and provided some magic moments for a team and crowd that had had to get used to the Third Division after the relegation of the late sixties. By the way, Gillingham won the match 3-2, but I don't know if Mike scored against his old club!